After the successful self-titled debut album, The Juliets are poised to take over the music scene. Formed in late 2008, the five-piece band of Jeremy Freer (piano/guitar/vocals), Sarah Myers (violin/vocals) and Kaylan Mitchell (cello) manages to seize new-age pop and classical music, applying their own twist with a violin and cello. 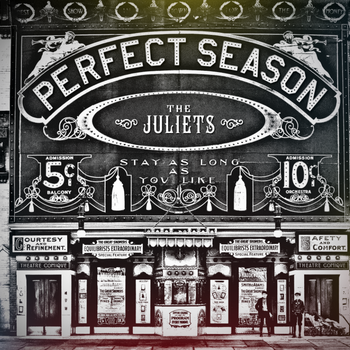 Perfect Season is produced by the band along with Dave Feeney and was recorded during February and March this year. It introduces the addition of Ashton Hopkins (bass) and Jaclyn Phillips (drums) producing a 12-track record of raved up, string-heavy music. One characteristic that separates The Juliet’s music from other bands is the use of strings, not as fillers but as forefronts to the tracks. Once you’ve listened to their sound, there’s a noticeable orchestra vibe combined with uptempo material – imagine The Beach Boys sharing the stage with Johannes Brahms. The album has genuine pleasures to offer. Whether it’s the guitar heavy Heart In Heart or the piano-utilizing G.W.N.L., it will not disappoint even the most astute music lover. The track entitled A Perfect Season is simply amazing. The soulful vocals of Freer matched with Shyer’s seamless violin creates a heart-melting ballad that brings you back to long conversations over coffee or cuddling on a lazy Sunday morning. One of my favorites is It’s Simple which features an upbeat melody and catchy lyrics. It has a playful vibe and soothing violin solos that make you want to hit repeat. The Perfect Season is a great follow-up album. The Juliets have lived up to their undeniably good music, delivering talent-packed songs that will seamlessly fit into everyone’s playlist. The album is available as a pay-what-you-want/free download.